Laminating film finishes are available in more than just gloss. When it comes to laminating jobs, you don’t have to just run gloss laminate. There are all kinds of laminating film on the market today, and a different approach can help you stand out above the competition in the minds of your customers. 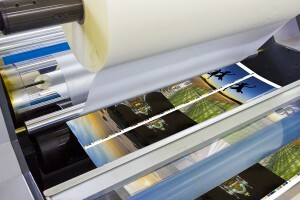 After all, laminating film is more than just the finished look. It’s also about texture, the way a product feels in your hands. Touch can play a huge part in the effectiveness of marketing materials like direct mail, post cards, coupon cards, and trade show material. Here’s a quick look into the various types of laminating finishes and how they’re frequently used. Glare can be a problem with gloss laminates. If you’re looking to create a softer image, matte laminate is the perfect solution. Matte provides a slightly granular texture, making it excellent for write-on capabilities. One handy application for matte lamination is in trade show signage, as the reduced glare helps to see images in environments with bright overhead lights. There are times when you will want just a little bit of glare, and that’s where luster laminate finishes come in. Also known as satin or semi-gloss, a luster finish is a blend of gloss and matte, so there is very little reflection. Not only does this make images appear elegant and rich, but also gives the impression that the document is not laminated at all. Luster is the best of both worlds when it comes to laminating finishes. Although direct light over a gloss print can make it difficult to view properly, gloss laminate isn’t without its advantages. If you are looking to pull colors out of your document, traditional gloss laminate is going to be the way to go. Images containing large swaths of solid color, portraits, and just about anything that doesn’t have an excess of fine details will come out much more beautifully with a gloss laminate. This entry was posted on Friday, September 30th, 2016	at 1:57 pm	and is filed under Printing tips	. You can follow any responses to this entry through the RSS 2.0	feed. Both comments and pings are currently closed.